Shop Online > For the Home > Island Alpaca Ceramic Mug, Sale: As low as $5.98 each! Island Alpaca Ceramic Mug, Sale: As low as $5.98 each! 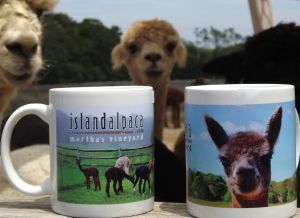 Our Island Alpaca Company coffee mugs are white ceramic, 10 ounces, with our colorful Island Alpaca logo and a wonderful image of our alpaca. Choose from one of two designs. An image of our herd grazing alpaca on the pastures, or our single alpaca, Island Alpaca Estrada's Guiseppe! Order one of each for a special price for a pair of alpaca coffee mugs. When ordering two please specify which design you would like at checkout! if not indicated, you will recieve one of each. The perfect 10 ounce size alpaca coffee mug for your favorite morning beverage or late night brew. Easy-grip handle. Treat yourself or give as a gift to someone special.